Eagles are incredible creatures. A 15 lb. bird can take down a deer that weighs multiple times its body weight. Their grip is phenomenally strong, some are strong enough to crush the skull of their prey, and their talons are often razor sharp, too. They will take and kill their own prey, they will steal prey from each other or from other animals, and they will also eat prey that is already dead, such as roadkill. Some of them will even begin to eat their prey while it is still alive. This is important to know, as we are hosting Lazio on Tuesday, also known as le Aquile, or the Eagles, and Milan often play more like roadkill. Lazio are coached by Simone Inzaghi, Pippo’s little brother. He was not as well known as a player, but is slowly starting to gain success managing crazy Lotito’s Lazio. His Eagles just devoured Oddo’s Delfini on Saturday. Like three goals in nine minutes devoured. Ouch. 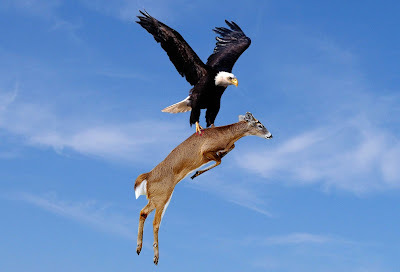 I didn’t even know eagles ate dolphins. For that 3-0 win over Pescara, Inzaghi lined up Marchetti; de Vrij, Radu, Bastos, Milinkovic-Savic, Parolo, Cataldi, Lulic, Anderson, Immobile, and Djordejevic. As of this writing, he is without Biglia to injury. Will they be scared little mice? Or will they be men? But the bigger issue is the mental fitness of a team that is 4.5 years into a mental yoyo, with inconsistency, turnover, and even more change on the horizon. Not to mention recurring discipline issues. If Milan don’t want to fall prey to Eagles in our own house, they will need to do more than run around like little mice, holding the ball and passing it backwards. Having snatched three points on Friday might help, but they’ll need more than luck and one sweet strike from a great assist to take down these Eagles. 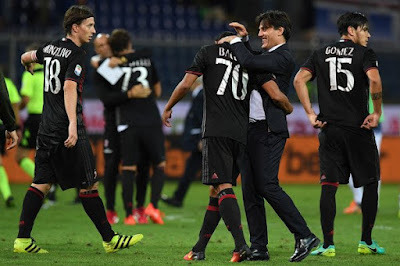 There’s a reason that eagles are at the top of their food chain, and even if Lazio aren’t top of the table, they will have no problems feasting on the roadkill that is Milan’s morale these days.